La République dominicaine (DR) offre les plages et les eaux les plus pittoresques des Caraïbes. Ce condo est situé dans le prestigieux complexe de vacances Stanza Mare. Imaginez-vous assis sur un tabouret de bar qui repose sur un pont gigantesque sur une table haute, tout en sirotant une boisson tropicale rafraîchissante. Vous avez une vue dégagée sur les vagues d'un bleu limpide qui cascadent calmement sur l'une des plus magnifiques plages de sable blanc. En outre, regard vers le bas à une piscine tropicale avec un pont et de chaume Cabanas. Ceci est ce que des vacances est tout! Le condo est situé dans Bavaro qui est à seulement 15 minutes de l'aéroport de Punta Cana (PUJ). Il dispose d'excellents restaurants, des épiceries, une boulangerie française, et de nombreux magasins de souvenirs dans les distances de marche. Si l'aventure est votre nom, de République dominicaine est l'endroit pour vous. Il existe d'innombrables excursions disponibles pour votre plaisir. Le DR a plongée en apnée, plongée, kitesurf, pêche, parapente, tyrolienne et même spéléologie juste pour en nommer quelques-uns. Le spacieux condo dispose d'une chambre, deux salles de bains avec une cuisine entièrement équipée qui possède toutes les commodités. Les serviettes et les draps sont fournis pour votre commodité. L'équipe de gestion parle couramment l'anglais et l'espagnol et est disponible 24 heures par jour. Si vous trouvez que vous avez des questions, ils sont prêts et disponibles pour vous aider dans de toute façon. Alors qu'est-ce que tu attends, nous sommes un appel téléphonique ou un e-mail à votre propre escapade paradisiaque! Todo muy bien excepto el sofá cama de la sala (colchon deteriorado o de muy mala calidad) y que el agua de bañarse estuvo muy salada por un daño en el sistema de ósmosis del condominio. We stayed here for 6 weeks and loved every minute of it. Great condo in a great location. Easy walking distance to markets and great restaurants. The condo had everything we needed to make it feel like home. We will definitely be back again. The condo managers Linda and Vicente were amazing and took great care of us. Beautiful condo in great location! Highly recommend! Just returned from a fabulous week at Stanza Mare, G305. Dec 2015. We were greeted by the kind and happy property managers for this unit, Linda and Vincente. The condo was spotless- much prettier and brighter than the photos online. I was very happy! All updated and decorated nicely and the entire complex, grounds and pool were clean and safe. Linda had arranged our ride from the airport which was very prompt and very convenient! We could walk to restaurants, markets, and most importantly, the beach was just steps away as you can see from the photos. We were so thankful that we cancelled the over priced all-inclusive resort reservation that we originally made because at those places, you have to take a golf cart or very long walk to beach and eat their not so good food. But here, at Stanza Mare, our room was perfect and we could walk everywhere! This unit has an updated kitchen with long bar that opens up to the dining area and living area, bathrooms were nice and clean. 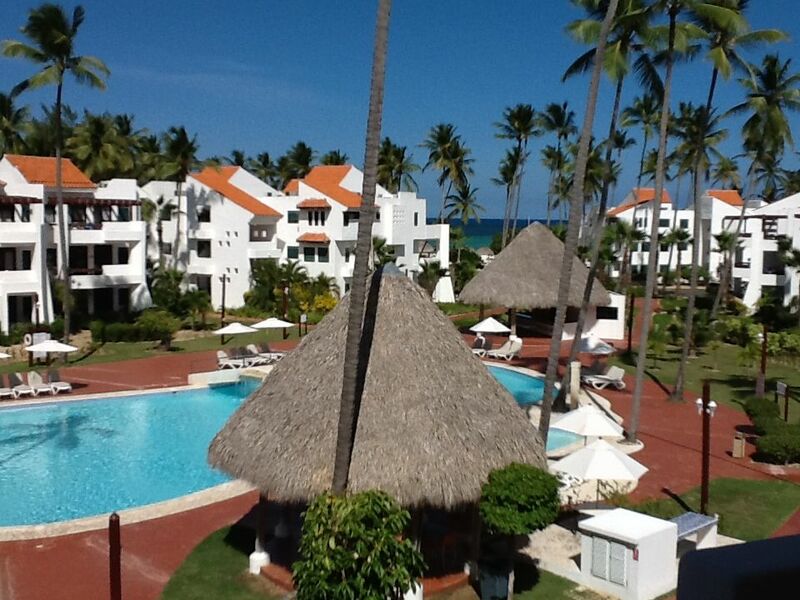 The balcony has a great view of the ocean, tall palm trees and nice breeze for breakfast and all day long! A/C and Wi-Fi worked great! No negatives at the condo or beach! We were a little disappointed in the snorkeling tours in this area and if we had more time, we may have gone to Caribbean side for calmer waters and tried to find less touristy tours! We snorkeled with El Gringo tour down the beach. The catamaran boat was big enough to have your own space away from others and not get sea sick. However, this tour and most tours only let you snorkel for about 15 minutes or less- we saw pretty fish as we fought the waves ..but then, the tours all take you to a swimming hole where people to stand in the blue water and drink rum with a zillion other party people and loud music which most people like except us. If you prefer snorkeling in remote areas, this is not it. However, outside our condo, good swimming and quiet compared to crowded resorts. We ate at some great restaurants located within a 5 minute stroll -very safe even at night... Don Pio- good Cuban food. Good pizza from Bella Napoli. Citrus was delicious. All of these restaurants were on the same block. No need for a car unless you want to go to other cities to sightsee. Stanza Mare has nice comfy lounge chairs and umbrellas on beach. Perfect peaceful romantic beach vacation! Highly recommend this condo! Thank you! Renter has $50.00 credit for electrical and monthly renter pays full electrical.